Oxford Dictionary’s 2017 word of the year was “youthquake”. Merriam-Webster Dictionary’s 2017 word of the year was “feminism”. A word that would run in my personal Top 10 of 2017 is “violence”. In many ways, it is related to the above two: “youthquake” and “feminism”. The complete redefinition and misuse of the word “violence” by the younger generation, made fashionable by modern day feminism and postmodern identitatrians, makes hyperbole out of an otherwise innocuous event. I’m afraid clickbait has sunk to a new low. We’ve lost all nuance when a 0.4% down day is described as “violent”. What is the opposite of a violent sell-off to describe the 7.5% year-to-date run up we got in less than a month? Safety? Normalcy? More like spoiled. When the bubbles pop, the debt-fueled economy unravels and we witness a real recession, what words do we have left to describe the inevitable crash (or even just a correction) that will occur? What’s more violent than “violent”? All we are left with is the end of the world. Armageddon. Evisceration. I disagree with TheStreet’s general stance itself. Some may be clueless, but millennials should be somewhat aware that speculation comes with risk and nothing in life is free. While they may not have witnessed the 90’s bubble, the 2001 dot-com bubble and the 2008 housing bubble, I’m sure many millennials have some exposure to the bursting of the cryptocurrency bubble currently happening. 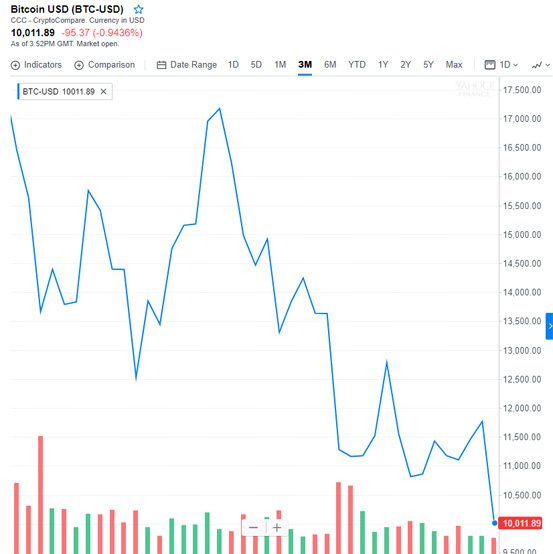 BitCoin has dipped its toe below the $10,000 level, which realistically is still overvalued. It is scary for the young speculators that blindly went all-in at $20,000, having 50% losses on paper and growing. But just like their inability to look at current day examples like Venezuela for bad monetary policy, they are equally as incapable of looking at cryptocurrencies as the current example of bad, leverage-fueled speculation. If you liked this article, leave a comment, share and subscribe to the RSS feed. Previous PostPrevious post: Facebook Messenger Kids App gets deserved pushback, but what about the parents?